*If you have a food processor, use it to mince all of the vegetables at once. 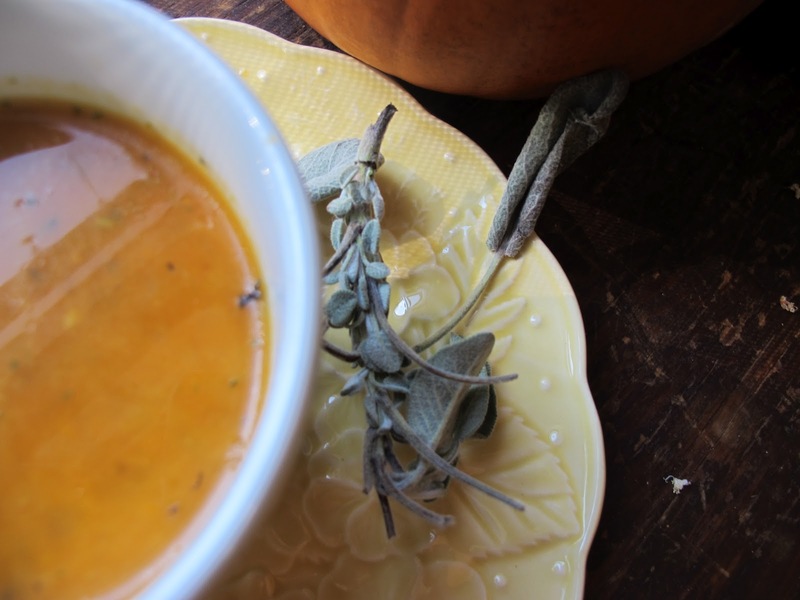 This is a heartier soup than the previous pumpkin or tomato that follows, but would be welcome to balance out a lighter meal. 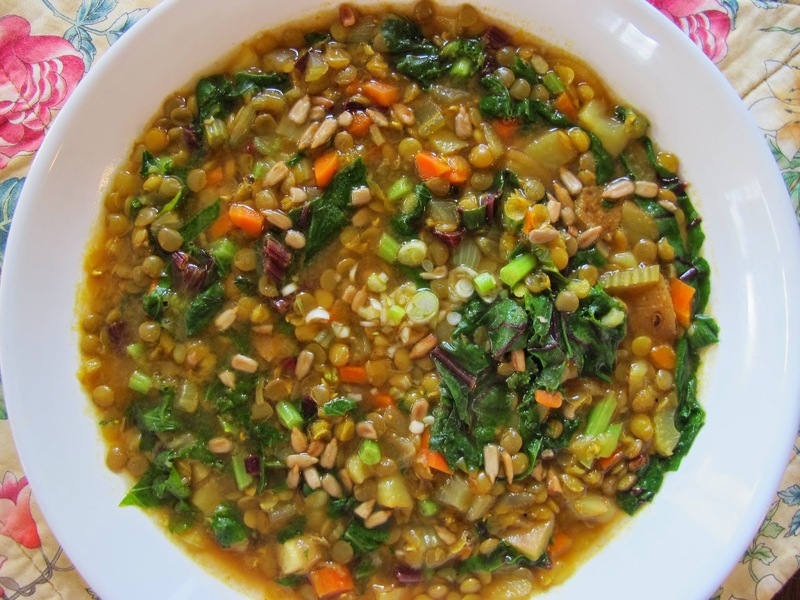 The lentils also provide a welcome amount of protein in the vegan diet–particularly if paired with a brown rice entree. My most recent lentil love soup — happily vegan, curried, and garnished with sunflower seeds and scallions. Into a six-quart stockpot heated over medium flame, cook for just a minute or so, stirring, the garlic, ginger, curry powder, and cumin. Add the onion, carrots, and celery; season with salt and pepper. Saute, stirring well, for ten minutes or until softening. Pour in wine; scrape up the bits at the bottom of the pot and let cook down for 2 or 3 minutes. Pour in water and vegetable stock; cover and bring to a boil. Add lentils, lower heat to a good simmer, and cook, stirring occasionally about 15 minutes. Add potatoes and cook until lentils and all of the vegetables are very tender. Add a bit more water if the soup is becoming overly thickened. Stir in the fresh greens and cook about 5 more minutes or until greens are nearly tender. Taste; adjust seasonings. Serve hot or cold garnished with a few sunflower seeds, a sprinkle of minced scallions, and a squeeze of fresh lemon. 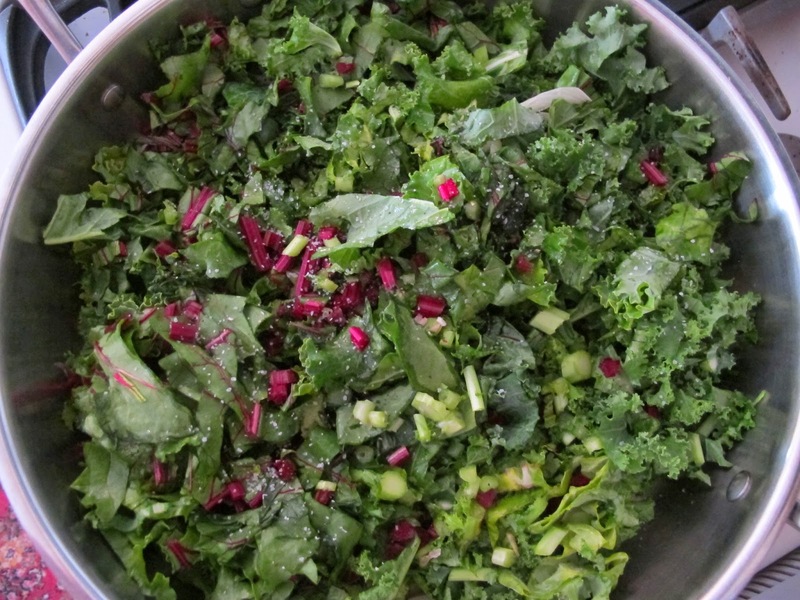 *You can use all kale or even fresh spinach or even arugula if you haven’t any beet greens. Please do use the stems; they’re quite good, though you must chop them finely–1/4-inch pieces or mince. This soup, originally made with chicken broth and garnished with chopped feta, was a favorite with testers for my book, Soups & Sides for Every Season. Here, it’s happily morphed just enough to be included as the broth is now vegetable and the cheese is swapped out for gluten-free croutons. 1. In an 8-quart saucepan, heat oil over medium heat and add carrots, celery and onion. Sauté five minutes, adding garlic for last two minutes. Stir in fresh herbs and tomatoes, breaking up tomatoes with fork or knife. You could food-process the tomatoes beforehand if you’d like. Cook briefly, one-two minutes to marry flavors. Add broth and salt and pepper. 2. Bring to a boil; reduce to simmer until veggies are tender, 10-15 min. Add extra broth or water if soup becomes too thick. Taste and adjust seasonings. If you’d like, you can purée this soup using an immersion blender, or carefully in batches in the food processor or blender. I like it with a bit of bite in it. Serve hot. 3. Ladle into small bowls and pass gluten-free croutons for garnish at table. *Don’t know how to make croutons? Buy a loaf of gluten-free bread and follow these directions for regular old croutons. Go beyond the typical potatoes, sweet potatoes, carrots, and squashes. Since there’s no turkey for those soft, sweet sides to cozy up to, you can choose whatever you want to jazz up the buffet. Think bright colors and popping flavors like vinegary greens or basil-scented summer-like vegetables. They’ll love it! This is one of my favorite vegetable preparations. Cook them not too awfully done; the bit of crispness on the Thanksgiving plate will be welcome alongside all the traditional soft coziness. Drain well and toss with 3 tablespoons olive oil, lots of salt and pepper, and the grated zest of two or three lemons, to taste. Sprinkle with a good pinch of crushed red pepper and toss well. Taste and adjust seasonings. I like a lot of lemon and not quite so much crushed red pepper. I’ll bet you can’t eat just one hot, warm, or cold. I eat these with everything at any temperature. 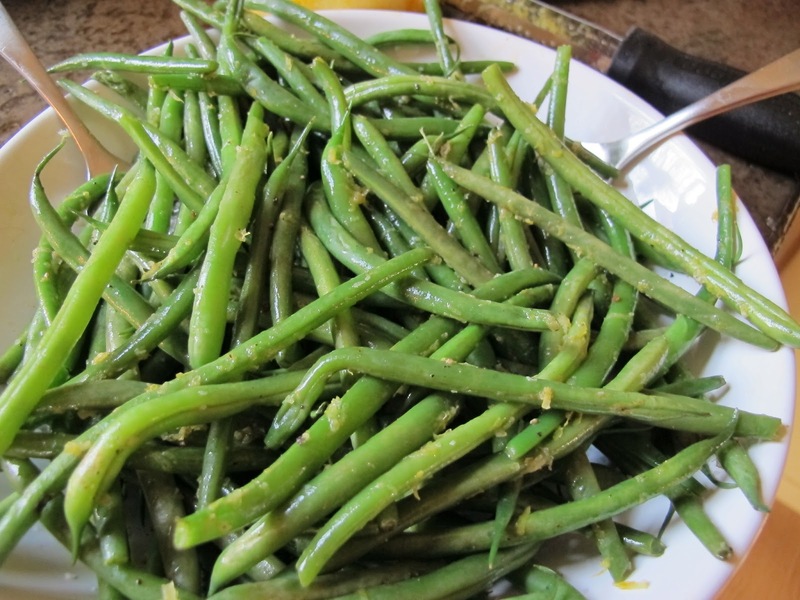 Cook’s Notes: For a more filling side, mix the green beans together with some rice (along with the olive oil, etc.) A squeeze of lemon juice might be needed; a cup or two of sauteed mushrooms and/or onions would be lovely. Tiny fresh tomatoes make a beautiful garnish and good contrast in texture, taste, and color. While this isn’t typical Thanksgiving fare, and certainly is at its best when summer bounty is at its fullest, today’s market does enable us to make something fun like ratatouille year-round. Besides, everyone — including carnivores — loves this. Give yourself 1.5 – 2 hours. While this cooks quickly, the chopping takes time. Preheat oven to 350. Place chopped eggplant on a baking tray, sprinkle lightly with salt and let sit while the oven preheats. When the oven is hot, blot the eggplant lightly on both sides with paper towels and drizzle lightly with olive oil. Cover the tray with foil tightly and bake about 40 minutes or until the eggplant is tender. Remove from oven, remove foil, and set aside. Meantime, in a large, deep skillet (or heavy soup pot), cook in the remaining oil the onions, peppers, and zucchini until they begin to soften, about 10 minutes. Add garlic, herbs, tomatoes, and tomato paste. Season with about 1/2 tsp of salt and 1/4 tsp of black pepper. Stir well, heat through and taste. Add crushed red pepper and taste again. Adjust seasoning if necessary. Let simmer 15 -20 minutes over low heat. Add eggplant and warm through. Add some of the reserved tomato juice if the mixture becomes too thick and is sticking or if you’d like a looser consistency. Serve as is (hot, warm or cold), with pasta or beneath fish or chicken if you eat such things. A big bowl of this and a hunk of bread folks can tear and dip into it is just about perfect food. Store tightly covered in frig 2-3 days or freeze for 3-6 months, well-wrapped. *To peel fresh tomatoes, cut an X in the bottom and top. Plunge into boiling water for a minute or two. Pull out, let cool briefly (til you can handle them without being burned) and peel off skins using a small sharp knife or your fingers. Chop coarsely before adding to ratatouille. Greens and apples with vinegar are a winner-winner combo. With a drizzle of maple syrup, they’re over the top in this very fast side. Remove stems from well-cleaned chard, slice thinly, and set aside. Roll up chard leaves and slice into 1/2-inch pieces. Heat 2 tablespoons of olive oil in a large, deep sauté pan with a pinch of crushed red pepper and the mint; cook 1 minute. Stir in shallots, reserved chard stems, and chopped apples. Season with a generous pinch of salt and a few grinds of black pepper. Let cook a minute or two, until a bit softened. Toss in chopped chard leaves and season with a little more salt and pepper. Stir. Cook 2-3 minutes or until chard wilts. Stir in apple cider and 1 tablespoon maple syrup. Taste and adjust seasonings, adding more maple syrup if you like. Serve hot or at room temperature garnished with chopped pecans. This is easy, lush, and spicy–if you want it to be. Good hot or cold. In a 3 qt heavy sauce pan, place 1 pound fresh cranberries, 1/2 lemon quartered, 1/2 large apple peeled and chopped, 2 cinnamon sticks, 1/2 t crushed red pepper flakes, and 1/2 cup (or more to taste) brown sugar. Add water to cover fruit, the pour in 1/2 cup red wine or apple juice/cider. Bring to a boil, and lower heat. 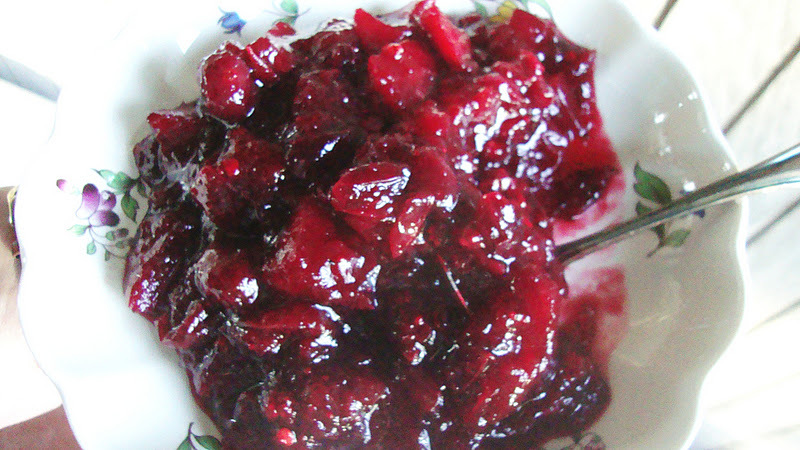 Simmer for about 15 minutes until cranberries pop, fruit is softened, and mixture is thick. Stir frequently and add water if it becomes too dry. Remove lemon to serve or let your sour puss friend eat it. (Oranges can be used in place of lemons or in addition.) Taste and adjust seasonings, adding more sugar if too tart or a splash of red wine vinegar if too sweet. Serve hot or cold. Keeps well in refrigerator for several days. If you do not like spicy food, leave out thecrushed red pepper. If you have a lot of folks coming, you might like more than one entrèe. Here are a couple I’ve made recently I think you might enjoy. While this rich and filling beautiful dish is a bit labor-intensive, it’s worth the time and effort for the holiday; I enjoyed figuring it out and making it. I thought about it for a couple of weeks before I finally got it to the stove. My husband, an adventurous eater who still loves his steak and potatoes, adored everything about the meal. It’s really no more work than making a ragu, etc., for a more traditional lasagna Bolognese. I made and baked the lasagna in the same afternoon, albeit with a few hours in between the two. I see no reason you couldn’t make it the day before, store it well-covered in the fridge, and bake it while the group is enjoying starters and soup. Do take it out a bit ahead to warm up or just plan on baking it a few minutes longer since it’s cold. 1. Sauté onions, seasoned with 1/4 teaspoon each salt and pepper in 1/4 cup olive oil over medium heat, stirring regularly, until very soft –15 minutes or so. Add garlic and cook another minute or two. Spoon into a bowl and reserve. 2. Cook the squash and kale Add sliced butternut squash, vegetable broth, thyme and sage to the same skillet. Bring to a boil, reduce to a simmer, cover, and cook until squash is tender, stirring once or twice–about 5-7 minutes. Remove to a large bowl and, still using same skillet, sauté chopped kale, a good pinch of crushed red pepper with another tablespoon oil and the white wine for 4-5 minutes or until tender. Add half of the reserved onions to the kale, turn off heat, and leave in the skillet. 3. Meanwhile, make Béchamel sauce. Heat oil over medium heat and whisk in gluten-free flour; cook 2 minutes or so, stirring. Slowly whisk in rice milk and cook, stirring regularly, until thickened; it will take several minutes. Be patient. Season with 1/4 teaspoon each salt and pepper and the nutmeg. Taste and adjust seasonings. Remove from heat and reserve. 4. Toss bread crumbs with parsley, a pinch of salt and pepper, and a tablespoon of olive oil in measuring cup or small bowl. Set aside. 5. Put the lasagna together: Preheat oven to 350 degrees Fahrenheit. Oil or grease a 9×13 glass baking dish. (Metal will work if that’s what you have.) Organize and arrange your ingredients so they’re close to the greased pan, otherwise you’ll drip all over the entire kitchen! (See above photo.) Spoon 1/2 cup of the Béchamel sauce into the bottom of the pan, spreading it out in a thin layer. Lay down one layer noodles (see note) and top evenly with a 2 cups squash; sprinkle 2 -3 tablespoons onion on top, along with a pinch each of salt and pepper. Ladle on one cup of Béchamel sauce, spreading evenly. Next, add all of the kale-onion mixture. Lay down another layer of noodles perpendicular to the first, then add the squash, onion, and sauce; repeat. Top with a sprinkling of the bread crumb mixture. Cover tightly with foil. 6. Bake on the center rack of the oven for 30 minutes, remove foil, and bake another 10-15 minutes or until bubbly and tender. Let rest 10 minutes; cut and serve hot. Cook’s Note: I had 6 noodles and divided them evenly; if you have more–and you just might– you can lay down 3 on each layer. I like each layer to be laid down perpendicular to the previous–so that if the first layer goes the length of the pan, the second goes the width. 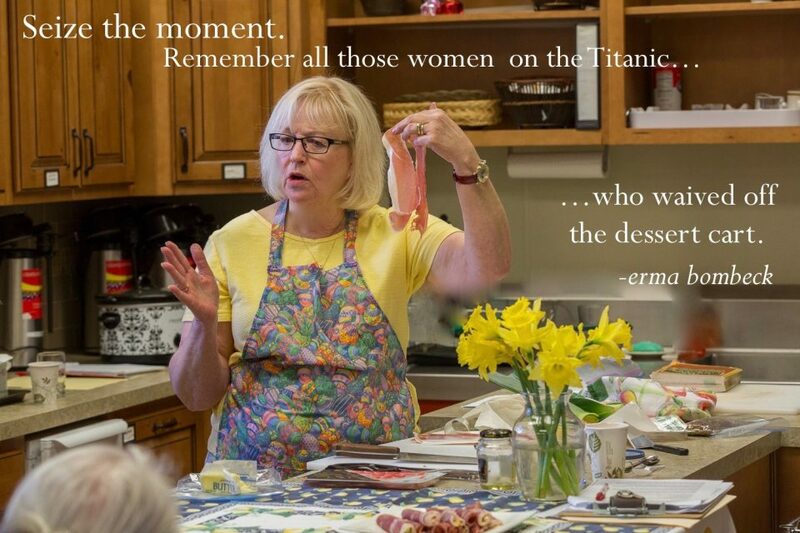 You may have some sauce left for another use or to warm and serve at the table. If you’d like to double the kale, I think it would work fine; there was plenty of room in my Pyrex casserole. Also, additionally, a layer of sautéed thick, meaty mushrooms might be lovely. *For ease of peeling this squash, I first cut it in half and microwaved it for 5-7 minutes just to soften it up a bit before peeling and slicing for the lasagna. To peel, I cut it into 3 sections, stood each upright, and sliced off the peel using a small, sharp knife. A peeler works, too, but it’ll take several swipes to get down through the white layer to the orange squash; the knife was just faster and more efficient for me. 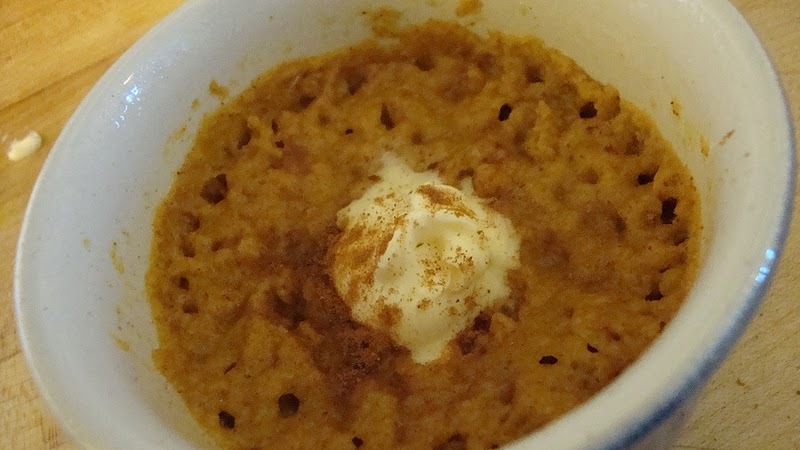 **I based my Béchamel sauce on one from What Would Cathy Eat.com? THANKS, CATHY! Cathy uses almond milk rather than rice. I had never made a vegan white sauce before. I’m crazy about this dish and you needn’t think of it as a salad if that bothers you. This is a main dish for anyone. Hearty brown rice — you could sub wild rice — backs up low notes of broccoli and almonds and provides a background for the teensiest bit of light sweet melody provided by the currants. You could use dried cranberries if you like; they’d be lush, bright, and beautifully red for the holiday. I made it a day before and stored in the fridge two hours or so before I needed it. It’s best shown off at room temperature. There’s nothing in it to go bad easily. 1. In a medium pot, heat water to boiling; add rice with a drizzle of olive oil and a few grinds of pepper. Lower heat to simmer, cover, and cook 45 minutes or until tender. While still hot, add 1/4 cup olive oil, the cooked broccoli, and almonds. Stir well and drizzle with 2 tablespoons red wine vinegar. 2. Stir in currants, curry powder (start with 1/2 teaspoon, adding more to taste), crushed red pepper, and 1/2 teaspoon kosher salt. Mix well. Taste and readjust seasonings, including curry powder. Add an extra drizzle or two of vinegar and/or oil to moisten and season if needed. You might also want to add more almonds or currants to taste; I liked the dish garnished with extra for looks and flavor. 3. Serve immediately at room temperature. You can also cover the dish well, refrigerate overnight, bring to room temperature, and serve the next day. If the rice seems dry, moisten using a tablespoon or two of olive oil and stir well. 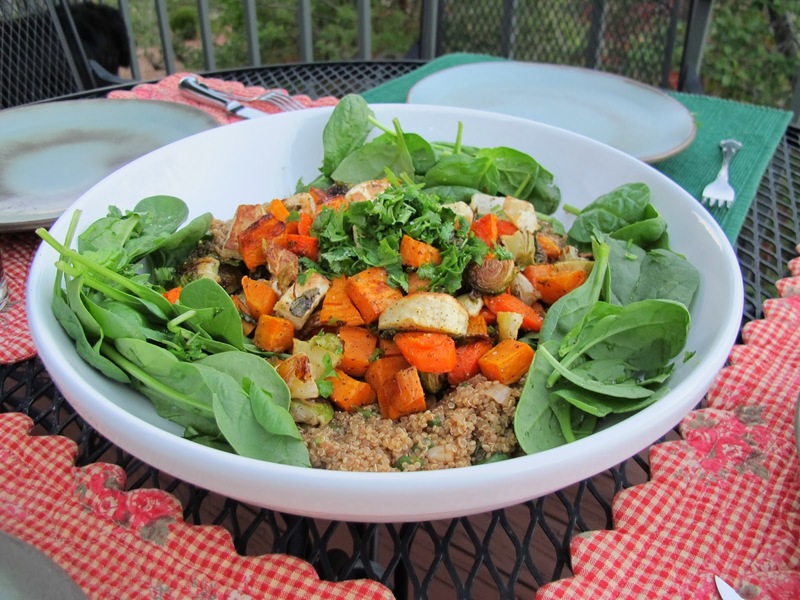 While you’ll need to go to Chowhound and find the recipe (adapted from Joann Chang), you can see by looking at this that it’s very simply a gorgeous amount of roasted root vegetables on a bed of quinoa. The idea is to roast some vegetables, cook the quinoa, and stir it all up together. Great food; great leftovers. What you don’t see is the Asian-style dressing — YUM. The given recipe on Chow calls for stirring the vegetables into the quinoa and doesn’t include the fresh greens. I thought the salad would be more attractive with the vegetables on top for visibility and I just loved the idea of a bed of freshness (the spinach or other greens) underneath for color and texture. The key element is the quinoa, which is quickly cooked –as quinoa is–and then stirred up with an Asian dressing that includes a whole bunch of chopped green onions. If you don’t like quinoa, make brown rice; it would work perfectly well. My other change was adding crushed red pepper to the Asian dressing. It’s almost perfect, but I thought it needed a bit of a bang. I didn’t do this, but next time I would add some toasted nuts of some kind–chopped walnuts or sliced almonds–for extra crunch. DESSERT. Wine: How about an American port? Coffee, of course! If no one wants to cook or bake, buy some lovely sorbet and call it a day. Or just have a gorgeous after-dinner brandy, port, or dessert wine as a digestif. I include just one simple dessert, but there are links to a variety of options if you’ll scroll down. You’ll find the non-vegan version of this dessert in my cookbook. If you’d really like some whipped cream, check this vegan whipped cream out on You Tube. Read all directions and notes before beginning, please! Grease 4 or 5 ramekins and set aside. Add a g-f ginger snap to each greased ramekin. Whisk all ingredients together in a large measuring cup and pour filling into ramekins (or custard cups or microwave-safe mugs) until 1/2 full. Cook each ramekin (or microwave-safe cup) on a plate in the microwave on full power for about 1 minute. * Watch carefully. If custard begins to overflow, stop oven, let custard cool for a few seconds and continue cooking. Using mitts or potholders, remove from microwave and repeat. Makes 4-5 servings. Let cool for a few minutes. Sprinkle with a sprinkle of cinnamon for garnish or top with vegan whipped cream. Love fall! Store leftovers tightly covered in refrigerator three-four days. *As microwave ovens vary in size and strength, your custard may take a little less or more time to make. You might also try microwaving at 50% power for two minutes. The other factor will be the size of your ramekin or cups. It’s done when just barely set. It’s custard; it should be able to do a bit of a jiggly dance and not be terribly staid and solid. Have a great day together! Most of these recipes are simply ones I’ve cooked in my own kitchen and are not certified in any way to be gluten-free or vegan, though they are as gluten-free and vegan as I know how to make them. I am not a nutritionist or trained chef, nor do I eat gluten-free and vegan daily. I hope I haven’t missed something, but if I have, know that it was inadvertent and make the best judgment according to the diet you follow. Please use your own discretion, read all labels, and cook and eat wisely. Thanks and Happy Thanksgiving!